Thermaﬂeece is harmless and can be installed without gloves or protective clothing, although we do recommend that you wear a dust mask in an enclosed space like a loft. It is not irritating to the skin, eyes or respiratory tract and causes no discomfort to site workers during installation. Any ﬁbres which happen to reach the living space will present no hazard to health. To retain the beneﬁts of water vapour, absorption and release, Thermaﬂeece may be used in conjunction with a vapour permeable underlay. Protect the insulation from prolonged exposure to sunlight when unpacked and avoid wetting for extended periods, store under cover and clear of the ground. 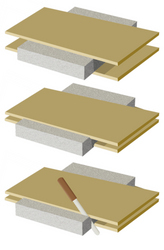 For accurate cutting, tightly compress or clamp the insulation between two pieces of solid 15mm board. Overhang the ﬂeece where you want to cut keeping the two board edges aligned. Saw cut the edge using a sharp, scalloped edged knife and keep the blade ﬁrm and square against both board edges throughout. Trim any ﬁne remaining ﬁbres with large scissors or shears. 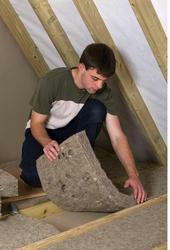 Thermaﬂeece can also be cut using a straight edge and a Stanley knife, or simply torn apart.